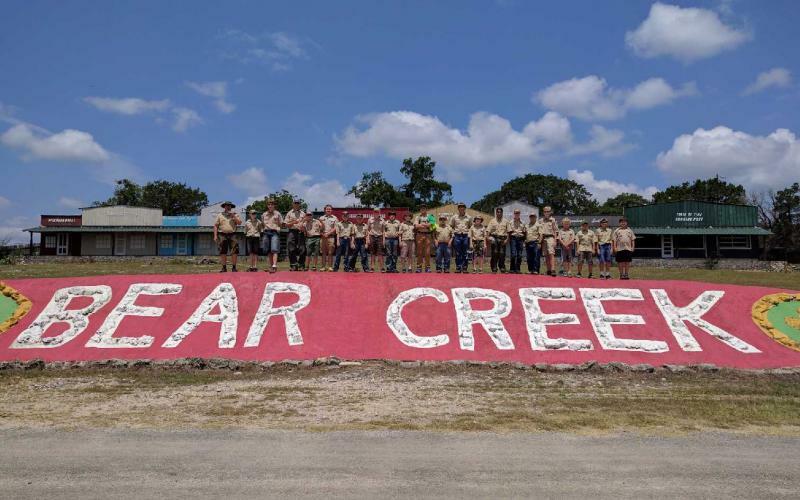 Twenty-Two Boy Scouts along with their four leaders from Troop 194 of Pleasanton, attended summer camp at Bear Creek Scout Reservation located in Hunt, Texas from Sunday, June 25 through Saturday, July 1. The troop was under the leadership of Ian Anderson and he was assisted by Paul Macmanus, Chuck Hannah and Jay Troell. Since 1957, Bear Creek Scout Reservation has been a summer home to thousands of scouts providing unforgettable camping memories. Bear Creek offers many boys their first opportunity to experience self reliance in a beautiful natural setting in the Texas Hill Country. In 2015, two zip-lines were added to the scout reservation which overlook the Guadalupe River and in 2017 two water slides were added as well. Boy Scouts Connor Below, Alberto De La Torre, Jacob Hess, Seth Macmanus, Carter McMain, Hunter Metting, Jairo Ortiz, Hondo Sadler and Zander Temple participated in the Ranger Program which is designed for first year campers and teaches basic skills while allowing the camper to get off and running on the requirements for Scout, Tenderfoot, Second Class and First Class ranks. During the week the Rangers work on their First Aid, Leatherwork and Swimming merit badges. On Thursday evening after dinner all nine Rangers were taken on a 2.5 mile hike to the Rangers Outpost up in the hills to camp under the stars. The nine Rangers remained in good scouting spirit during the hike to and from the Outpost and returned back to camp around seven a.m. in the morning. During the week-long camp, the other thirteen scouts worked on various merit badges including archery, art, basketry, camping, communications, cooking, emergency preparedness, environmental science, insect study, life saving, Indian lore, mammals study, metalwork, orienteering, personal fitness, photography, pioneering, pottery, soil and water, space exploration, swimming, reptile and amphibians, weather and woodcarving. On Tuesday, June 27, Troop 194 was selected to present the colors for the morning flag ceremony. Representing Troop 194 as the Color Guard under the direction of Cade Macmanus, Senior Patrol Leader were Augustin De La Torre, Wesley Maspero, Blaine Macmanus, and Garrett Bahn. On Friday afternoon, members of the Troop participated in the Bear Creek Games which included skills in shooting, swimming, archery, canoeing, and running. On Friday evening at the campfire closing ceremony our troop performed a skit under the direction of Blaine Macmanus, for which the troop received the “Best Skit Award.” The “Uncle Duder Honor Troop Award” is an attractive green and gold troop flag pennant that is presented to all units meeting the Uncle Duder standards of good camping. When a unit meets or exceeds the camp standards during its week at camp it will be known as an “Uncle Duder Honor Troop” and awarded a troop flag pennant at the Friday night campfire. Cade Macmanus, Senior Patrol Leader accepted the Uncle Duder Honor Troop Award on behalf of Troop 194. Our Troop was the only troop at camp to receive this prestigious award. The troop also won the overall Bear Creek Games, and Koal Schaub was given the “5 and Dime Award” for his sharp-shooting skills, as he shot 39 out of 50! At the close of the evening, the Aina Topa Hutsi Lodge of the Order of the Arrow held an impressive Call-Out Ceremony in a spectacular setting which was backed by fire, the Guadalupe River and a 120-foot cliff. The Troop would like to thank Brandon Below, Pack 194 Cubmaster and Donna Metting for their help with driving our scouts to Bear Creek and J. R. Maspero, Jason Schaub, Danny Morrison and Joett Morrison for helping to drive our scout’s home and special thanks to the Noon Day Lions Club, their charter sponsor.